How do you manage to piss off your allies Ben Carson, Ann Coulter and Sarah Palin in a span of forty-eight hours? If you’re Donald Trump, all you have to do is be yourself and watch everything go terribly wrong accordingly. Worse for Trump, his allies have begun turning against him for different and arguably incompatible reasons. Even as he scrambles and tries to rectify things, that seems to only be costing him allies as he goes. 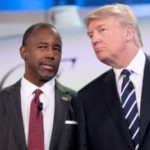 Even though Carson, Coulter and Palin are national punchlines among mainstream Americans, make no mistake: Donald Trump needs these three clowns if he wants to hang onto any dwindling chance of winning the election. They each have a fairly narrow but strongly devoted base somewhere on the lunatic end of the conservative spectrum. And because Trump can’t seem to win over the votes of moderates no matter what he tries, he needs to retain the favor of the three stooges and the voters they represent. But Trump managed to turn both the nutty Sarah Palin and the purposely offensive Ann Coulter against him in one fell swoop this week as he hinted that he might retreat from his extremist anti-immigrant positions. Alt-Right pundits like Palin and Coutler have built their respective bases by convincing conservative white losers to blame their own problems and failings on minorities and immigrants. When Trump threatened to soften his racism, he threatened to cost them money. It’s why they’ve each come out swinging against him.